Yesterday, I was searching for articles about William Montague Nicholls, Class of 1912, the first Citadel Man killed in the First World War. A young man from Spartanburg, South Carolina, he left his father’s law practice in 1914 to join the war in Europe and served in the British Royal Field Artillery. While I found several news articles of interest, the one item that continues to elude me is a picture of him. There should be one of him in the Naval Academy’s 1914 Lucky Bag, but I have not yet found the senior class’s pages digitalized on the web. During his second year at The Citadel, he won an appointment to the Naval Academy at Annapolis, Maryland, and he joined its Class of 1914. The article that caught my attention and imagination though was Wilton Garrison’s “Sports Shots” column printed the day before the Wofford College homecoming of 1934. Wofford, situated in Spartanburg, would play against The Citadel Bulldog football team. Photo source: 1909 Sphinx. Courtesy of The Citadel Archives and Museum, Charleston, S.C.
We were talking with Perry Sessions  yesterday about football and he recalled The Citadel team of 25 years ago as one of the gamest and most courageous teams he had ever seen play. Squads were small in size and numbers in those days, but there was plenty of spirit: freshmen could play on the varsity then – and the coaches used them, too. The Citadel team of 1909 was coached by the great Sam Costen, who was All-Southern quarter at Vanderbilt on a team that was undefeated and tied only by the Navy his senior year. 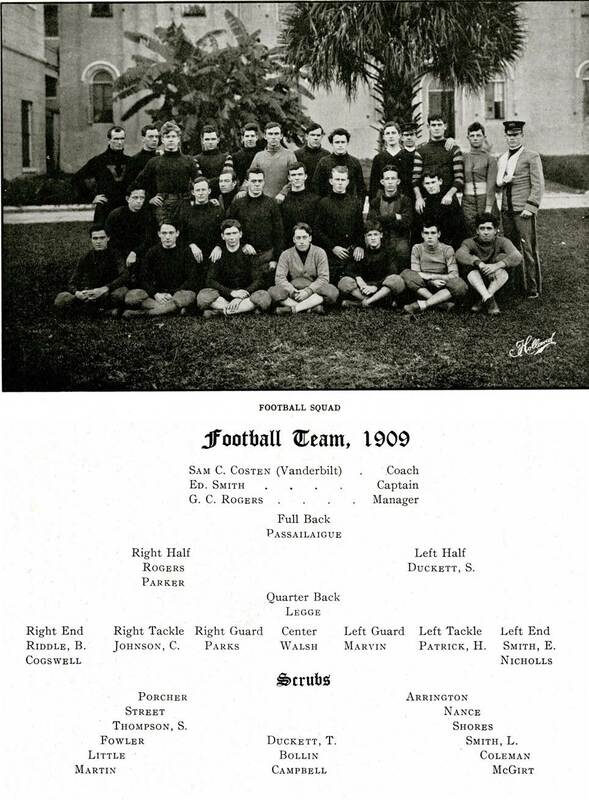 That year (1909) The Citadel played Georgia and Davidson to 0-0 ties. Clemson put Rogers, star halfback out with a broken arm; Riddle, an end, had his arm wrenched. Montague Nicholls, a freshman and a fine end and punter, also had his arm broken; Montague was a brother of Sam J. Nicholls, Spartanburg attorney,  and was later a great quarterback at the Navy. Citadel lost to Clemson, 17-0 after these injuries. 1909 was a year of firsts, and Montague, a freshman, was a part of that history. The 1909 team was the first to be officially called the Bulldogs, and their first ever road trip took place on November 3, 1909 to play Davidson at the County Fairgrounds in Orangeburg, S.C. PRESENT day historians have made many prophecies concerning the effect of the war in Europe upon civilization. Ponderous documents have been written foretelling the number of years it will take to rebuild the cities, to restore the peaceful commerce of antebellum days and to pay off the monstrous debt incurred by the belligerents. One phase of the grim, desperate struggle that has escaped notice in the more momentous questions of the day is the effect of the War upon athletics. The 1916 Olympics were scheduled for Berlin, but it is doubtful whether there will be any for many years to come, and it is likely that international tournaments will be called off until the places in the ranks of the noted athletes killed or incapacitated can be filled. Montague’s body was never recovered. His name is among the more than 20,000 carved into the Loos Memorial which surrounds Dud Corner Cemetery at Loos-en-Gohelle, France. The memorial and cemetery are maintained by the Commonwealth War Graves Commission. 1914 Lucky Bag article on the Army-Navy Game of 1913. Col. F. Perry Sessions, Class of 1910, President of the Citadel Alumni Association 1930-32, and alumni member of The Citadel Board of Visitors during the 1940’s. List of CAA Past Presidents. Samuel J. Nicholls was a member of the U.S. Congress from 1915 – 1921. See Biography. The Spartanburg Herald, Spartanburg, S.C., Friday, November 2, 1934, p. 13, col. b.
 Wikipedia: The Citadel Bulldogs football 1905-1910. This entry was posted on March 19, 2013 by Roger Long. It was filed under Loos, Uncategorized and was tagged with Army-Navy football, Battle of Loos, CGWC, Citadel Bulldogs, Citadel Football, Citadel Men, Great War, History, Loos Memorial, Royal Field Artillery, S.C., Spartanburg, Wofford, WWI.